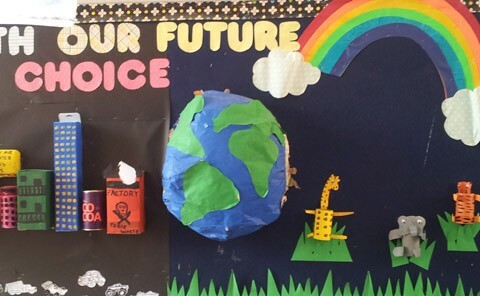 The school has been in a pioneer in environment initiatives and through an effectively delivered Environment Education curriculum ensures that our children grow up to be individuals who are sensitive to the environment and carry with them the message that scientific development must go hand in hand with action safeguarding the environment. 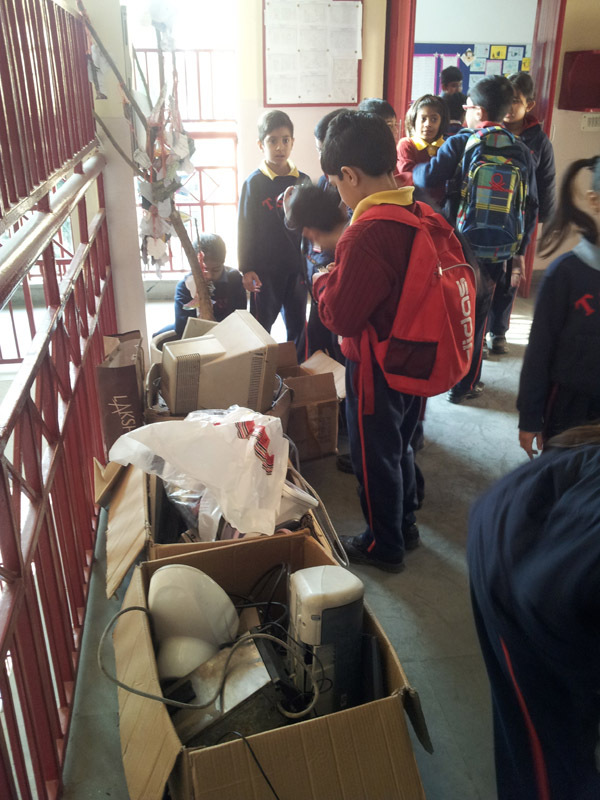 Members of the Shri Paryavaran club consistently monitor energy usage in the school with a view to reducing wastage of electricity; they take daily rounds of the school to check that the lights, fans/ACs etc are switched off when any room is empty. 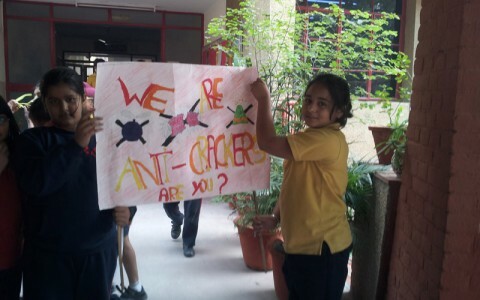 Children of grade 5 took out an “anti-cracker” march just before Diwali, in the school’s neighbourhood. A session on ‘Tiger Conservation’ for classes 4 & 5 organized by Kids for Tigers (KFT). Anya Sen & Mira Ghosh, members of Shri Paryavaran participated in a nature walk, orgainsed by KFT, at the Chief Minister’s residence on 21st December, 2012. 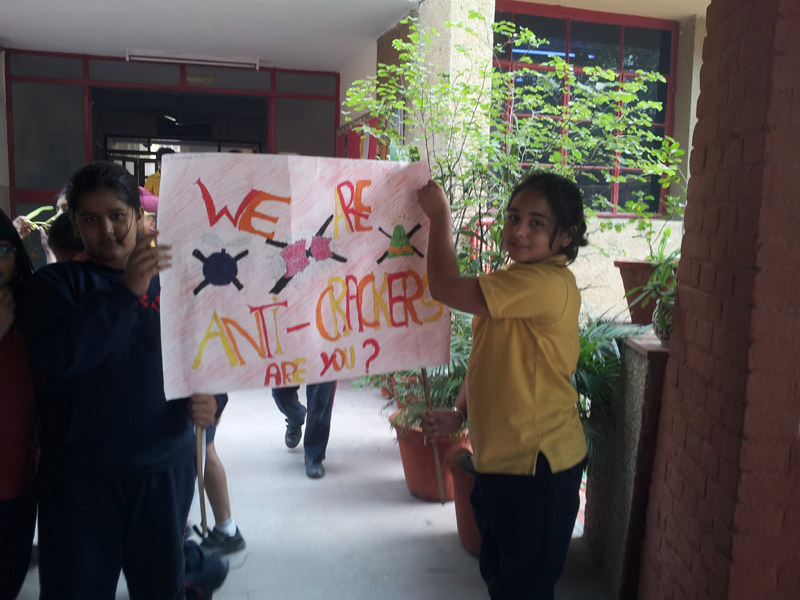 ‘Bags for Earth’ – A drive that the entire school participated in and one that allowed the students to take concrete steps towards saving the Earth and help the Delhi Government’s fight against the use of plastic bags. Despite the ban on plastic bags, many shops still use plastic bags rampantly. For the smaller grocery shops/stationery shops etc, saving even a couple of rupees means a lot and they are usually unable to afford the more expensive paper/cloth bags. Distributed to some small shops in the neighbourhood by student representatives of each grade along with sensitization messages to the shop owners regarding the dangers of plastic bag usage. Sold to raise money for more environment initiatives. 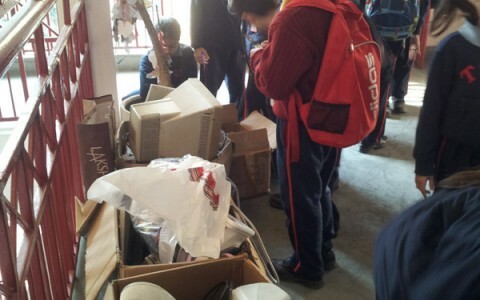 To make the school more energy and waste conscious and aiming to be certified as a “Green School”. Integrating more gardening practices by the children in the form of individual small pots/area to grow seasonal vegetables, organically. Involving the Shri Paryavaran club children in more interschool environment clubs to give them greater exposure and more avenues to work towards inculcating an environment consciousness.